Much debate, research and commentary about class sizes in schools is limited because of an exclusive concern with class size and pupil academic attainment, and a neglect of classroom processes, which might help explain class size effects (or lack of them). Very little is known about the central question: how can teachers make the most of class size changes? Much of the commentary on class size effects has focused on Western and English-speaking countries but there are promising developments elsewhere, particularly the 'Small Class Teaching' initiatives in East Asia in the past decade, which have brought new knowledge and practical wisdom to the class size debate. This book seeks to move toward a clearer view of what we know and do not know about class size effects, and to identify future steps in terms of policy and research. There is a huge and exciting potential for international collaboration on knowledge concerning class size effects which can help with research-informed policy. 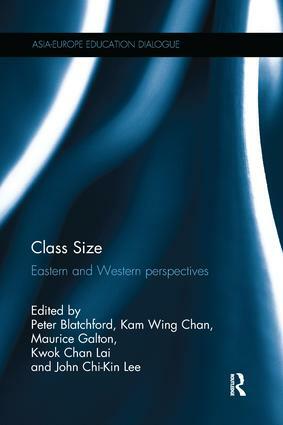 The book aims to draw out Eastern and Western international contexts which underpin any understanding of the role of class size in school learning. Professional development for small class teaching in East Asia. The right question in the debates about class size: Why is the (positive) effect so small? Does class size (still) matter?